The barriers between Windows 8.1 and Windows Phone 8.1 just crumbled even further, as Microsoft introduced WP 8.1 versions its Reading List and Movie Moments apps to the Windows Phone Store on Wednesday. Reading List, a “save the article and read it later” app, is baked right into Windows 8.1 on PCs and tablets, while Movie Moments’ lightweight video editing is available for those devices to download in the Windows Store. 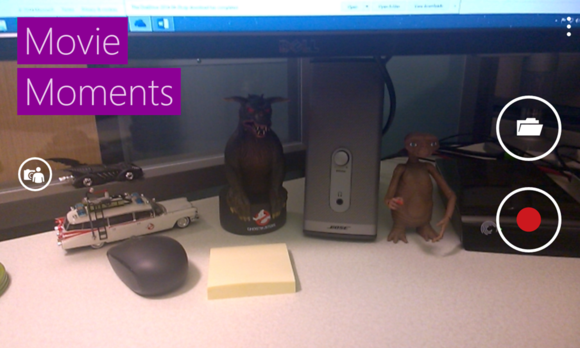 Both fit right in on Windows Phone 8.1, albeit for different reasons. Reading List’s home screen in Windows Phone 8.1. 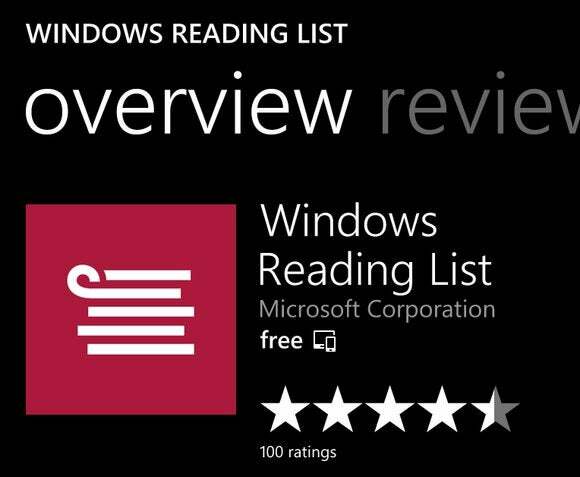 The addition of Reading List to Windows Phone is a particularly nice move. 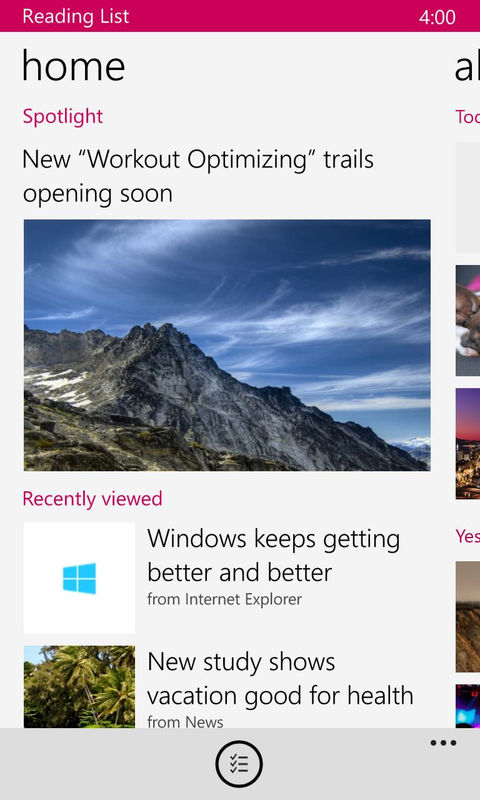 While you can bookmark content and articles in Internet Explorer or any Windows Phone app for later perusal in Reading List, the true secret sauce lies in the app’s ability to sync with the Reading List material you’ve saved on Windows 8.1 devices, so that articles you bookmark on your PC or tablet show up on your phone, too. It’s a damned shame that the ability to save articles to your Reading List queue isn’t supported by the desktop version of IE on Windows 8.1—only the Modern UI version of Internet Explorer can share articles to Reading List. Here’s hoping Microsoft manages to plug that glaring hole, especially as Windows shifts back toward a more desktop-friendly stance in general. I’d love to be able to use Reading List without being forced to use the Modern version of IE on my desktop. As is, I use alternatives like Pocket to scratch my read-it-later itch. You won’t find mobile Pocket or Readability apps in the Windows Phone Store however, so the new Reading List app fills a valuable hole if you’re all-in on Microsoft’s “One Windows” multi-device vision. But enough digressing! Reading List lets you sort your saved into articles into customizable categories, and the Windows Phone version supports pinning those individual categories to your Start screen—a particularly handy touch. Searching and filtering are also supported. The new Movie Moments Windows Phone app doesn’t have any of Reading List’s fancy cloud-syncing tricks, but it’s interesting, if not necessarily handy. The app lets you pick a 60-second clip from any video on your phone, then add captions and music—either pre-supplied or your own—to it. When you’re done, you can save the clip or share it via social networks. Nope, it’s not complicated, but it’s fun. In fact, it’s even more fun on phones than on Windows 8.1 PCs or tablets, since Windows Phones have cameras bolted to them and Movie Moment’s basic options translate well to the mobile interface. Those same simple controls just plain seem dumbed-down when you’re sitting at a computer, to be frank, since a wide world of robust desktop video editing options are available for Windows 8.1. Movie Moments is a simplistic blast of fun on Windows Phones, though. Want to try the new apps out for yourself? The superb Windows Phone 8.1 update isn’t yet available for general download, alas, but that doesn’t mean you can’t start using it right now. If the idea of using beta software doesn’t scare you off, here’s how to download Windows Phone 8.1 today. Be sure to give Cortana a spin.